The existence of the universal tiler and the regular polygon decomposition theorem allow us to draw some more conclusions about extending certain vertex figures to periodic tilings of the plane. Let R be the set of all rhombs and regular polygons. then the figure can be extended to a periodic tiling of the plane using the prototile set consisting of the triangle, the n-sided regular polygon and the SRI(3n) set of rhombs. If a vertex figure consists of three polygons from R, two of which are an n-sided regular polygon and a triangle, then the figure can be extended to a periodic tiling of the plane using the prototile set consisting of the polygons in the vertex figure and the SRI(3n) set of rhombs. As we will see in the next section, the triangle extension theorem can mostly be derived from the regular polygon extension theorem. Both theorems are considerably stronger than the simple statement that any regular polygon can be extended to a periodic tiling of the plane, so it is worth looking at why they are true. Let's start by proving the regular polygon extension theorem for the case n = 11. Consider this diagram, which labels 5 vertices and their associated angles on one of the hendecagons in a decomposition of the 66-gon. What we can show is that if we choose an appropriate position function, then the set of all the vertex figures centred on the blue vertices on the 6 hendecagons decomposed from the 66-gon contain every possible vertex figure consisting of two SRI(33) rhombs and the hendecagon. 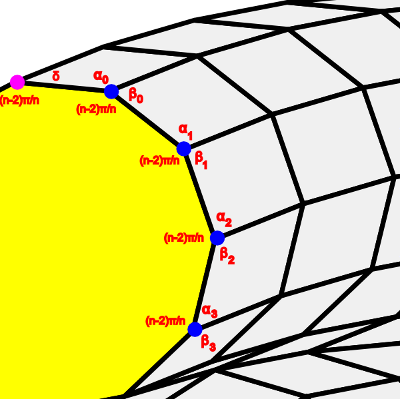 Thus we know that, conversely, any possible vertex figure consisting of two SRI(33) rhombs and the hendecagon can be extended to a periodic tiling of the plane. In this case, since n is odd, we do not have to be concerned about the exception for elements of SRI(n/2). Notice that the SRI(33) rhombs in the vertex figure cannot take on the values kπ/33 where k < 7. Why not? Because the angle of a hendecagon is (n-2)π/n = (11-2)π/11 = 9π/11 = 27π/33 and if (say) we combined this with the rhomb with angle 6π/33 then because this is a vertex figure, the sum of the angles of the hendecagon, the 6π/33 rhomb and the third rhomb must be 2π. Thus we are looking for the set of rhombs with angle kπ/33 where k >= 7. If the original set of edge colour classes is [0,1,2,3,4,5], then the position function we will choose eliminates class j at stage j of the decomposition. Thus the class list goes from [0,1,2,3,4,5] to [0,2,3,4,5] at stage 1, to [0,3,4,5] at stage 2, then to [0,4,5] to [0,5] and finally to . Let's start by looking at the angles of the blue vertices for the first hendecagon and then extrapolate these results for the other hendecagons in the decomposed 66-gon. We can then generalise the results for any n.
Consider the angle δ associated with the magenta vertex. δ is not associated with the blue vertices but we need its value to calculate the angles associated with the vertex figures surrounding the blue vertices. Now we can see that the angle of the hendecagon plus δ is equal to the angle of the 66-gon. δ = (32-27)π/33 = 5π/33. Once we know δ, it is easily to calculate α0 since they are the opposite angles of the same rhomb. Calculating δ for the hendecagons in the residual polygons is not that much harder. If we consider the next case, we have the colour edges [0,2,3,4,5]. How do we calculate the angle between edge 0 and 2? and this is the angle between edge 0 and edge 2.
and in fact each time we remove an edge class we reduce the angle between the edges by π/33. Notice that these are the same vertices as for the first case, but in the reverse order! So in this particular case, this adds nothing new. If we look at the [αi, βi] pairs above, we can see that either αi or βi take every possible value of 7π/33, .. 32π/33 and so the proof is complete for n = 11. Now for the general case. We know that we are looking for two rhombs with angles k0π/3n and k1π/3n that together with the n-gon make a vertex figure (and so the angles must add to 2π). As before, we must be careful to choose the rhombs so that the sum of the n-gon angle and one rhomb is always more than π because the angle of the second rhomb is always less than π. Thus, the value of n does not matter! So this becomes a case of integer arithmetic. for any n > 3. We can see that we are missing all values of the form 3n - 6i. The highest value is j = 4, i = 0, or 3n-1, just what we need in all cases. We can see that we are missing all values of the form 6(i+1). We can see that combining these two sets of numbers fills in the missing numbers at the beginning and the end. The first set is sometimes missing the first 3 numbers (7, 8, 9), but the second set always has these. The second set is sometimes missing the last three sets of numbers (3n-3, 3n-2, 3n-1) but the first set always has these. The fact that the first set is missing numbers of the form 3n - 6i and the second set numbers of the form 6(i+1) is impossible to fix however if n is even. To see why, set n = 2m. Then we see that the missing numbers are of the form 3n - 6i = 6m -6i = 6(m-i) and for the second case 6(2m+1). In this case, both sets are missing numbers that are a multiple of six. The problem does not occur if n is odd because then the missing numbers for the first set are not the same as the missing numbers for the second set and combined the sets have all the numbers we need. Thus we see the missing numbers are all members of SRI(m) = SRI(n/2) which completes the proof except for the case when n = 3. In the case for n =3, the available angles from SRI(3*3) = SRI(9) are only 7π/9 and 8π/9 so this case reduces to the question of whether there is a periodic tiling containing the 3.(7π/9). (8π/9) vertex figure. 7π/9 is the large angle of the 9-rhomb and 8π/9 = 16π/18 is the large angle of the 18-rhomb. We already have seen a periodic tiling that combines the triangle and the large angles of the 9-rhomb and the 18-rhomb. This is the 3.9.18 Warrior tiling. This completes the proof of the regular polygon extension theorem. It is curious that the theorem does not currently include the case of the vertex figures composed of the n-gon and rhombs from SRI(n/2). I wonder if it is the case that in general such vertex figures cannot be extended to periodic tilings or if another proof is needed for this case. Certainly there are specific examples that do work. For example, the 5.5.10 Gears tiling contains vertex figures composed of decagons and members of SRI(5).